Works for broadcast and performance on a temporary city-wide FM frequency developed during two-month residency at KC Tobačna and radioCONA, Ljubljana, Slovenia, December 2013-January 2014.
radioCona REuseCITY: REuseRADIO is a research/exhibition project that takes place across an FM frequency, a gallery, and urban space. It focuses on parallel possible uses of the city and radio frequencies. 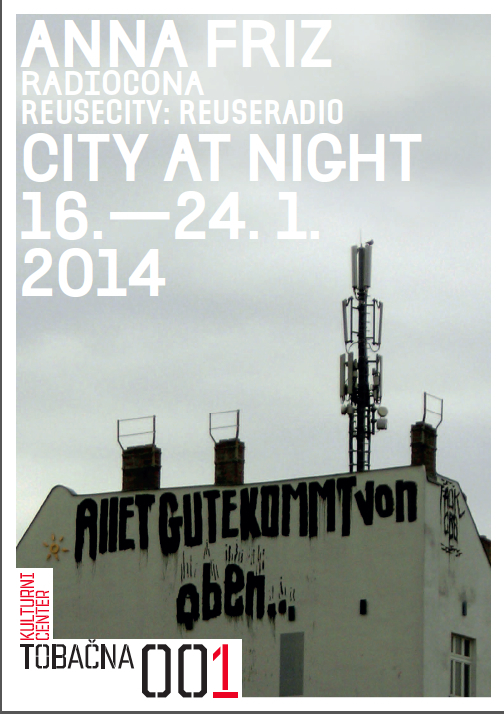 REuseCITY: REuseRADIO brings together and presents a selection of works combining the medium of radio or sound with a certain site or place, with a special focus on nighttime. At such time the landscape becomes more ambiguous and porous to the imagination, which is underscored by nocturnal broadcasting. The exhibition listens to the environment to uncover its hidden potential, drawing attention to its fluid and mutable nature and to how one perceives instabilities in the environment. The participating artists respond and play with contingency by marking their locations, using transmission technologies to reframe space. The selection and presentation of their diverse sonoric poetics seek to unveil the patterns embedded in an environment, our ingrained ways of perceiving the city and electromagnetic territories, and to incise them, transform them, and open them up to unexplored possibilities. radioCona REuseCITY: REuseRADIO is a collaborative work with the Canadian artist Anna Friz, who has been creating new installation, performance, and broadcast works under the title City at Night during her two-month residency in Ljubljana. She frames the city at night as “a space of potential: filled with pleasure and danger, subversion, reclamation, and escape; described by its transformation from the quotidian arena of day into sites of shadow, ambiguity, and reverie. The nocturnal world of radio is a similarly charged space of potential, relieved of the routines of the working day. Electro-magnetic activity is the invisible print of the city, with overlapping fields of activity passing through the built environment. Signals converge and the city is imagined and made. City at Night seeks to rethink and reframe the urban through its nocturnal signals and through incursions across the social spaces and empty places of the city after dark. The exhibition brings together Slovenian and international artists working in radio art. Artists from the region were invited to take part in a workshop organized in collaboration with Anna Friz, to explore possible approaches to examining nocturnal cityscapes through the use of radio technologies. New sonic productions were developed at the workshop. Thus in addition to presenting the curators’ selection of existing radio art works, the exhibition also serves to premiere new works made at the workshop by Marko Batista, Simon Macuh, OR oiesis, Maria Papadomanolaki, Lea Promaja, Mikro, Vasja Progar, and Brane Zorman. radioCONA begins 5 nights of broadcasts, heard on 88.8FM in Ljubljana. Opening of the exhibition City at Night: White Night at the KC Tobačna 001 Cultural Center, Ljubljana. 20:00: performance by Anna Friz. 22:30: City at Night on two frequencies: tune in on two radios to listen to radioCona 88.8FM, and Radio Študent 89.3 MHz. Anna Friz and Brane Zorman create a live mix for two frequencies. City at Night exhibition continues at Tobačna 001 from 16-25 January, 2014. Art’s Birthday retransmission party with cake! Tobačna 001, radioCona, ORF Kunstradio, Vienna, and international partners. Translocal performance between Anna Friz, Ljubljana and Maja Osojnik, Vienna; with lots of local guests. The Cona project and program are supported by Municipality of Ljubljana. My travel to Ljubljana was generously made possible by the Canada Council for the Arts, Media Arts division.